You cannot be serious !!!!!!!!!!!!!!! The only grass roots movement in our Parish is that attached to the stuff which the Parish Council never cut-for which I pay some ridiculous part of my Council Tax. More seriously-Party Politics on a Parish Council?????????? Yep-you only have to hang around UKPR these days-which seems to have become a little corner of the Great Labour Party Schism. A lot of talk about Labour voters switching to LD and Green but I always suspected a lot more switch to the Conservatives than perhaps Labour members realise. Interesting article by Finkelstein, on what might happen if Labour split. He recalls his involvement in the SDP, and the battle between Owen and Jenkins over the soul of the party. Jenkins won, and the SDP followed a more liberal path, meaning couldn’t retain seats in the north, and beaten by Liberals in the South. Eventually effectively taken over by Liberals. You may well be right, in those E&W marginal seats that matter under FPTP. It seems to me more about the control of the party than the ideological question of homousion or homoiusion. Having said that even at the time of the great schism it wasn’t really about the unified existence of the three forms or the separate existence of the father, the son and the Holy Ghost either. The interesting thing is that is now done openly in this leadership contest, and confusingly it makes it quite boring. I have compared the situation within Labour to the schisms within the Scots Kirk. Total collapse of Other Party. Do you really think the General Voting Public care “what its about” ? What they see is a Party whose two factions are at war-which actually hate each other. They see a never ending slanging match. And according to an anecdote upthread, they see people introducing this stuff into their local Parish Council.! What do you think they conclude about The Labour Party today? To be fair, tried to,introduce it and failed. Local communities are rather more adept at dealing with these sorts of things. But the worrying thing for VI is that this is a Parish in North East Somerset. Labour until 2010, labour need this seat and the surrounding seats to form a government. Annacdotally, local ex miners, former labour voters are going UKIP. I would also echo others sentiments that a lot of the new labour members don’t seem to want to deal with democracy in the sense we understand it but want control and power, equally they tend (gross generalisation coming up) believes that they should get everything for nothing. Hence little effort and not actually finding anyone to put up as a candidate. Historically our Parish Council was labour only, no one else allowed. There is no one left from labour prepared to put the effort in locally. Sad really in so many ways. I just hope it is not a national trend. Strong opposition is required for good democracy. It is definitely boring. I followed the labour leadership election last year with a lot of interest and some anxiety, for selfish reasons. I was feeling a bit fed-up of Cameron and Osborne and very much wanted the option to dump them at the next election and was feeling quite cross that Lab were refusing to provide one. This time I find it an effort to follow and basically I think it doesn’t matter what happens to Lab. I’ve got what I wanted, which is a new govt effectively, so am content for now. I also think that there is ample time for an alternative party to surge and take on the role of the main opposition by 2025 at the latest. Is this what they felt in the 1920’s? Did they simply get bored with the squabbles between the Lloyd George Liberals and the Asquith Liberals, and moved on to the new coherent party that was taking shape (Labour)? 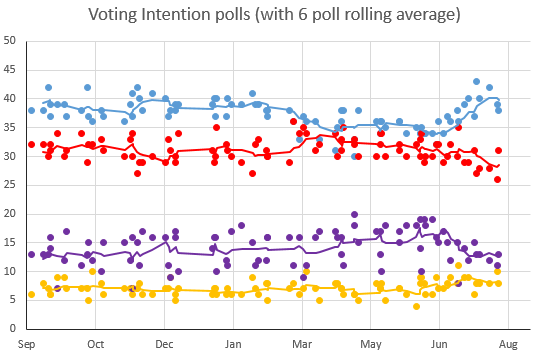 Having just looked at the Ipsos Mori tables in detail , it is clear that the headline voting intention figures are based on just 657 voters – ie those who indicated they were at least 90% certain to vote. The precise figures came out as -Con 44.6% Lab 34.1% with the lead at 10.5%.. The Lab to Con swing was 1.95% across GB implying a Tory majority of 46. In England the swing was a bit lower at 1.5%. No, I really don’t think that the rest of the voters (well, perhaps some of them) care what this whole LP contest is about beyond incomprehension (which then draws the only rational conclusion). Hence my point of the time needed for the public to forget this summer of Labour. If Corbyn wins and continues as he does, it will be repeated without the slightest doubt. If he goes in hard, there is some chance (people often confuse leadership with ruthlessness), providing that he can find good bureaucrats. If Smith wins, he has to find the magic stone really – and I can’t see what it can be. If it is there, and he finds it, Smith can win, because it would be a bigger miracle than winning the GE. @Syzygy seems to have a very different experience. I have done a bit of phone canvassing for Smith and quite a few people are very much influenced by the testimony of the three (all female) shadow cabbers who have explained why it was hopeless serving under Corbyn.